Ahh, the sounds of songbirds and the glimpses of fresh greens emerging from a long winter's sleep. These are just some of the things to look forward to in this Spring season. You too can take part in this season of surprise by changing up your home's interior. Reinvent your space with a change in color perhaps. Replace warm woolens and sateens with cool and crisp cotton and linen fabrics. Switch from a throw pillow decorated with winter scenery to those filled with light and airy geometrics and floral motifs to welcome the outdoors inside. As we witness nature's rebirth, we gather together images for our latest look book. The imaginations of our designers has us oohing and aahing yet again. Beautiful bed and bath linens fill the pages and evoke the beauty that can be seen all around. From the beginning, we realized that a lovely and oh-so-comfortable bed was founded upon perfectly filled and stitched down and silk fillers. That's why we strive to make the best down pillows and comforters along with DEWOOLFSON'S signature duple silk bedding. Click on any item within this look book to be taken to that page on our merchant website - dewoolfsonlinens.com where you can discover more. We hope you find our Spring look book inspiring your own reinvention. in a kaleidoscope of 60 hues. 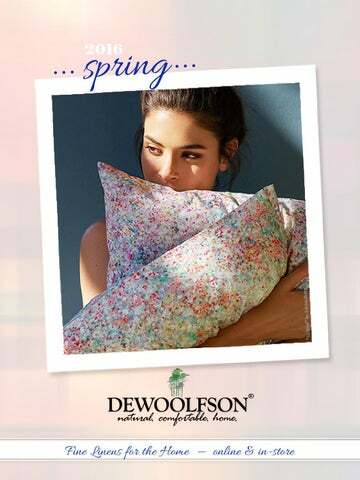 DEWOOLFSON速 comforters, pillows, and featherbeds are individually filled and sewn from the finest materials and shipped from our North Carolina factory within 48 hours. We use only hand-select European white goose down or feather fills, covered with some of the world's finest European downproof fabrics, including your choice of cotton cambric, batiste, sateen, silk, and an eco-friendly organic cotton. Our comforters are available in up to five warmth levels, and can have additional down added anytime within a year of purchase. Our down pillows are fully adjustable for firmness within a year of purchase (charging only for shipping and the cost of the additional down, by the ounce). Silk-filled comforters are the perfect addition to DEWOOLFSON's line of fine sleep products. Silk, a natural insulator that stays cool in the summer and warm in the winter, is one of the oldest known textile fibers and the preferred fill for sleeping comfort in many countries. Duple is DEWOOLFSON's term for double silk. Silk filled and silk covered. Our summer weight is covered with a lightweight (13 momme weight) silk habotai cover and stitched in a traditional butterfly pattern. The winter weight is covered with a heavier silk satin (19 momme weight), sometimes described as "buttery smooth", and sewn in a box stitch pattern. Both are filled with the finest hand-pulled mulberry silk floss. Naturally hypoallergenic. Eggshell white.